Chelsey and Erin will be expecting you! You’ll be greeted with a warm and friendly welcome. We’ll show you to our comfortable and relaxing waiting area. Make yourself at home and feel free to help yourself to coffee, tea, water or any beverage available. We’ll ask you to complete some paperwork! Next, we’ll take you on a tour of our office. 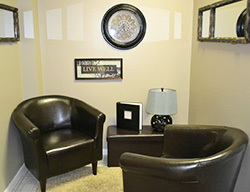 We will show you our rooms and the types of therapies we may offer during your care. Your tour ends in the consultation room. Our office manager, Jackie will spend some time getting to know you. She will go over your health history and ask you to share any other concerns you might have. Do you have specific questions about chiropractic adjustments, finances or the care you’ll receive? Ask us, we want you to be comfortable and have all the answers! Our doctors care about helping you get well and stay well! We will bring you to the exam room where you will meet the doctor. After we discuss your health concerns and we review your health history a thorough exam is performed. We will do a very extensive neurological exam, including muscle testing, digital X-rays and other tests. These tests will give us a clear picture of the structure of your spine. They also help us determine if you’re a good candidate for chiropractic care. During your second visit a video analysis and presentation is done. The actual test results are shown and explained to the patient. We educate you on your health issues and explain what we think will help. “No doctor has ever given me an examination like this before”, is the opinion of most patients, following the second visit. It is at this point that your journey towards feeling better begins! Regular visits usually last for 15 minutes. When patients get adjusted on a regular basis, they usually feel great! “Our patients are here because they want to be here”, asserts Dr. Riecker.